In order to obtain reproducible imaging where the meaning of the image data has a well-defined meaning we have to transform this data to a standardized color space. The CIE color spaces (CIE XYZ, CIE L*a*b*) look promising, but they are not very efficient for storage, and the resulting images cannot be readily displayed because this requires a lot of extra computations. The sRGB color space does fit the bill, even if it has a restricted gamut. For details on the actual transform the reader is referred to here, but suffice to say that we determine the transform based on the color values measured on a high-quality color chart (the MacBeth Color Checker Chart) included in the image. The whole process of chart detection, measurement and image transformation is performed automatically and typically takes 6-8 seconds for a 5 Megapixel image. As an added bonus the exact physical resolution in the plane of the chart is also determined and set, and this means exact distance and area measurements are also possible. the chart must be completely visible and must make up enough of the image, say 5-10% or more. If these conditions are met, and the images are not too much over- or underexposed calibration will proceed and the resulting sRGB images will represent the scene, as it would be seen under a CIE D65 illuminant. 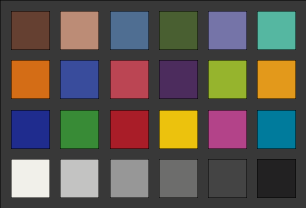 This is the obvious choice for sRGB images, as the whitepoint of this color space is also CIE D65. Fig. 5: Three images taken in full automatic mode (exposure, aperture, white balance), illuminants from left to right: CIE D65 (typical outside lighting), TL84 (fluorescent tube) and CIE A (tungsten lighting), after calibration. Top row camera is a Nikon D200, bottom row is a Canond 10D. Comparing those images with the ones of fig. 3, we can safely state that the Canon 10D white balancing is superior to that of the Nikon D200. Fig. 6: Histogram of the reproducibility of color measurements in dE* units These curves represent the probability distribution of the dE* color difference between color measurements of the same area in 2 different images of the same scene, with (green) and without (red)calibration. Fig. 7: Histogram of the accuracy of color measurements in dE* units. These curves represent the probability distribution of the dE* color difference between color measurements of an area in an image and a spectrophotometric measurement, with (green) and without (red)calibration. The 'normal' image set is restricted to images with either fully automatic camera settings or proper manual settings (the whole image set contains a lot of images with improper settings like over- and underexposure and wrong whitebalance). Objective, realistic presentation of products/subjects/scenes, e.g. for a web site. Quantitative comparison of images and image measurements, because imaging is not only reproducible but also accurate with respect to colorimetric measurements (remember, sRGB has a known relationship with the CIE color spaces). Geometrical measurements (area, distance) are also possible because the exact scale of the image was determined during calibration. Proper exchange of images because the meaning of the image data is fixed. This allows e.g. third party validation of measurement techniques or image processing, and paves the way for remote collaborations, e.g. in tele-medicine.